Giant Company is the Canadian manufacturer of gas, electric and oil-powered water heaters designed as tank-type and tankless type and used for potable water and space heating, in residential and commercial applications. Check out the reviews of the popular models, benefits, and main features. Giant water heaters for home use are available in several groups and sizes, from the small point-of-use tank-type and tankless – design, to the large, whole house units. Smaller models are recommended for places that lack in space, apartments, cottages, offices... while the larger ones are for families of two/three members and up, and can be installed in garages, basements, attics, crawl space and utility rooms. 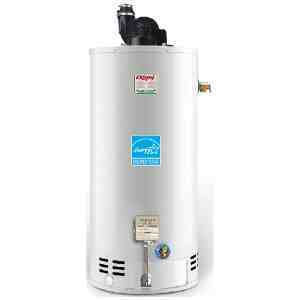 Electric water heaters from Giant come in sizes from as low as 2 gallons to the popular 60-gal units, where the most advanced and highest performing units belong to the Cascade and Super Cascade series with the EcoPeak technology. These heaters are known as the conventional models – cylindrically shaped units that utilize a metal tank to store hot water. Giant gas water heaters are designed as the floor standing tank-type models and as the wall-mounted tankless models that heat water on demand, providing continuous hot water supply as long as it is needed. 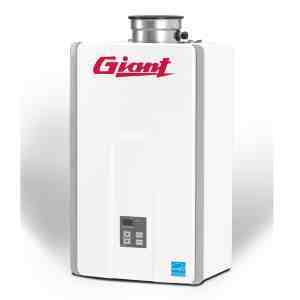 As some of the top North American manufacturer of water heating appliances, Giant also offers a hybrid model, a high performing unit that combines a tank-type and tankless technology into one system, resulting in better recovery and efficiency. As opposed to the electric models and its simple design, gas water heaters are more advanced and complex and based on the type they use different venting solution; atmospheric, direct or power vents. Some of the great advantages, (some models) include the high efficiency and great savings. Those models with the energy factor of 0.67 for the tank-type and over 0.9 for the tankless are Energy Star compliant and what you should aim for. 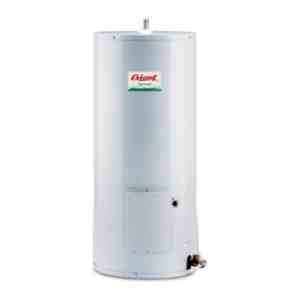 Some of the top features that are found on Giant water heaters include the GreenFoam – an environment-friendly foam insulation for better heat retention, quality brass drain valve, EcoPeak technology – great for reliable operation during peak times, condensing technology for ultra-efficiency, long warranty and other. Gas tankless models (on the picture) are even more complex due to its advanced tankless technology and electronics, and here is the detailed review for better understanding. Most of the models mentioned above are designed for both residential and light commercial applications, but there are also models specifically designed for commercial applications, including the storage tanks.